Bird's eye view of the city of Macao, By Johannes Vingboons. Ca 1660. Click for the full image. Macau comprises a small, narrow peninsula projecting from the mainland province of Guangdong and the two islands of Taipa and Coloane. Extending up a hillside is the city of Macau, which occupies almost the entire peninsula. The name Macau, or Macau (Pinyin: Aomen; Wade-Giles: Ao-men), is derived from the Chinese Ama-gao or 'Bay of Ama', the patron goddess of sailors. The first Europeans to arrive at the coast of China was the Portuguese. The first ship anchored in the Pearl River estuary in 1513, and further Portuguese visits followed regularly. Trade with China commenced in 1553. Four years later Portuguese paying tribute to China settled in Macau, which became the official and principal entrepôt for all international trade with China and Japan and an intermediary port for ships traveling from Lisbon to Nagasaki (at the time, Japan’s only outport for trade). Missionaries arriving on Portuguese ships turned Macau into an East Asian center of Christianity. Even though China’s trade with the outside world was gradually centralized in Guangzhou (Canton) toward the end of the 18th century, merchants were allowed into Guangzhou only during the trading season - from November to May - and the international merchant community established itself at Macau. By the mid-19th century the British colony of Hong Kong had surpassed Macau in trade, and within a few years the merchants had largely deserted the Portuguese possession, which never again was a major entrepôt. In the 1930s and '40s Macau, declared a neutral territory during the Sino-Japanese War and World War II, became a refuge for both Chinese and Europeans. The Chinese population in the territory continued to grow when the communist government assumed power in China in 1949. In April 1987 Portugal and China reached an agreement to return Macau to Chinese rule in 1999. On Dec. 20, 1999, Macau became a special administrative region under Chinese sovereignty. There are few natural resources, an exception being fish in the Pearl River estuary, which are used for local needs. Much of Macau's imports consist of raw materials or semifinished goods for manufacturing purposes. One of these goods were whole or partially undecorated porcelain blanks onto which local companies added enamel decorations. 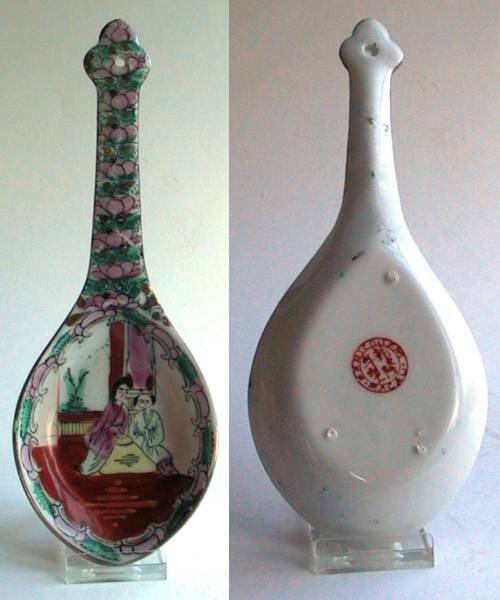 These porcelain blanks appears to have been manufactured at various locations in mainland China, of which Jingdezhen in Jiangxi province can have been one however, the porcelain wares often seems to look different than the typical Jingdezhen wares. The polychrome porcelain industry once ranked fifth among Macau's industrial exports. The first polychrome porcelain production in Macau started in 1950. With no substantial increase of the porcelain export during the 1960s, in 1970s the porcelain export started to grow 45% annually, from about 5 million MOP$ (Patacas) per year until it reached about 26 million MOP$ (Patacas) in 1979. One important reason for this was the increase in property value in nearby Hong Kong that gradually pushed out the labor intensive porcelain workshops to less expensive land, which was found in Macau, that was also politically stable still under Portuguese rule. During 1980 to 1986 the porcelain export continued to grow but slower, by 23,5 percent annually. In 1987 Macau Ceramic exports topped the one hundred million Yuan mark until in reached its highest point in 1988 after that the export had increased a further 18.7% over 1987. In 1981 Macau had more than 40 polychrome porcelain factories, employing a total of nearly 2,000 people. The last few decades had seen many small factories closing shop or becoming absorbed by other firms so that by the mid-1980s, fewer factories than before produced more decorated porcelain than ever. output. Some of these were large, in particular Heng Hui Polychrome Porcelain [恒辉彩瓷行], whose factory occupied several thousand square meters over three floors and employed nearly 1,000 people. Heng Hui also operated a second factory in Shantou (Guangdong Province) which employed another 2,000 people. 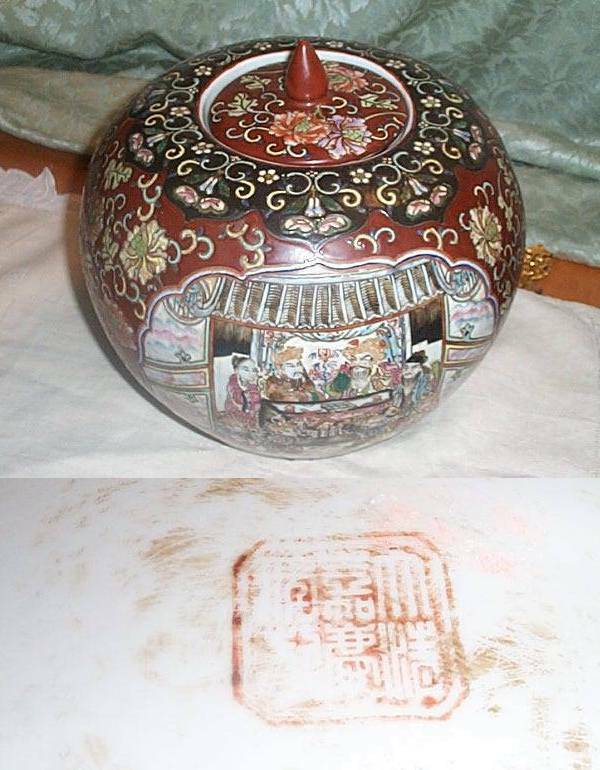 This porcelain base with its various marks and stickers shows how porcelain from China got its enamel decoration added in Macau. The year 1989 was a turning point for the Macao porcelain enameling industry. The western 'China fever' began to cool off and the Macau ceramic industry saw its export decrease with a fifth as compared to previous year. In 1990 the west experienced a recession. In combination with competition from Chinese mainland private kilns, this caused the largest decline in 40 years, export dropping with 43.6%, causing polychrome ceramics to slip from Macau's fifth- to its tenth-ranked export industry. In 1992 the value of exports dropped even further. The main reason being the polychrome ceramics export quota set by mainland China, which caused a lot of the polychrome ceramic production to move inland. The background to how this industry came about was the political upheaval during the first half of the 20th century, the Sino-Chinese war in 1935 and the communist takeover in 1949. All these events contributed to a relocation of small scale porcelain decoration industry, that could be set up anywhere with very modest capital. Ultimately a workshop or home industry did not need to be larger than one single individual, or one family, to which any importer or exporter could sub-contract work. During the cultural revolution in China from 1965 to the early 1970s the porcelain export industry in China took a downturn and much trade moved out to Hong Kong and as it seems, Macau. 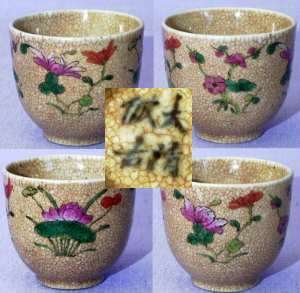 Porcelain that we based on style and marks can place in this category of Macao ware are mainly those that we due to marks and stickers can tell for sure that their origin is Macau. Over time we have also observed that the "Macao enamels" are a bit more opaque than any other enamels, and are are therefore easy to recognize. When this collate with other characteristic signs, they have also been added to this section. Somehow there is sometimes - as always when it comes to Chinese porcelain - a conflict between marks and reality, and some "Macau" pieces does seems to come with a "Hong Kong" mark too. Geographically it is not far between neither Canton, Macau or Hong Kong located in the Pearl River delta in the Guangdong province of China however politically, the difference in the last quarter of the 20th century was considerable. Transport wise, by boat, we are talking about a few hours at most. The style of the "Macau group" is however easily recognized by its slightly "un-Chinese" style of decorations and its often pale or opaque enamel where the Hong Kong studios characteristically use a brighter enamels, that I and Simon Ng between the two of us started to call Hong Kong Cai. Until further, I have decided to group these marks and pieces, decorated in this peculiar style under one headline, to make it easier to study and identify them. Since Macao was a detour between Jingdezhen for the blanks, Macao or Hongkong for decoration, and then export via Hongkong, Macao was a detour and a historical parenthesis. Maybe in a hundred years it will be recognized and collected because of just that. Introductory text written together with several expert members of the Gotheborg Discussion Board. Trade statistics based on Chinese sources and translated by David Lane. 1532. Mark: Da Qing Yongzheng Nian Zhi meaning: "Great Qing Dynasty, Yongzheng Period, Made". Chinese porcelain tentatively decorated in Macau based on style of mark and appearance of mostly the base which is typical of Macao decorated wares. Date: second half of 20th century. 636. Da Qing Qianlong Nian Zhi - "Great Qing Qianlong Period Made". Tentatively suggested to be "Macau Style" but uncertain until further. Probably 3rd quarter of 20th century. 1388. Mark: Da Qing Qianlong Nian Zhi meaning: "Great Qing Dynasty, Qianlong Period, Made". On the base a paper label, Chinese porcelain decorated in Macau. Date: probably c. 1970. 559. Da Qing Qianlong Nian Zhi - "Great Qing Qianlong Period Made". 'Macau style' enamels. Mid 20th Century. This piece however hastily decorated demonstrates that there appears to be no significance between seal marks of this kind having a double frame, or none. 1538. Da Qing Qianlong Nian Zhi - "Great Qing Qianlong Period Made". 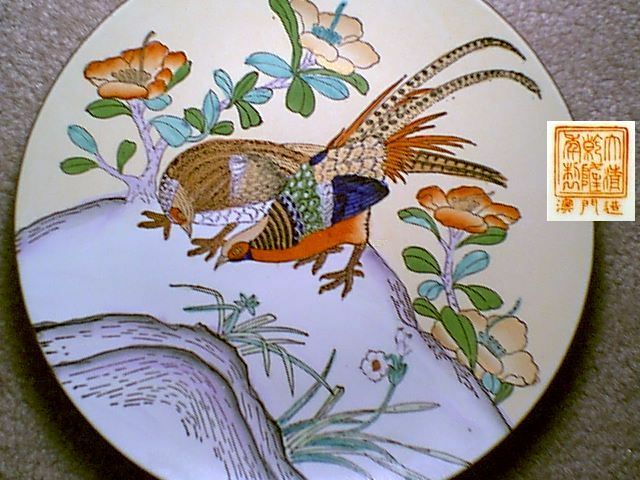 Decorated in 'Macau style' with raised enamels in moriage style, imitating Japanese Kyoto Satsuma. Third quarter of the 20th Century. 1459. Mark: Da Qing Qianlong Nian Zhi meaning: "Great Qing Dynasty, Qianlong Period, Made". On the base a paper label, Chinese porcelain decorated in Macau. Date: probably c. 1970s or later. 792. Mark: Da Qing Qianlong Nian Zhi meaning: "Great Qing Dynasty, Qianlong Period, Made". The three words below the mark reads Ao Men Zao meaning "made in Macau". Date: probably c. 1970. 841. 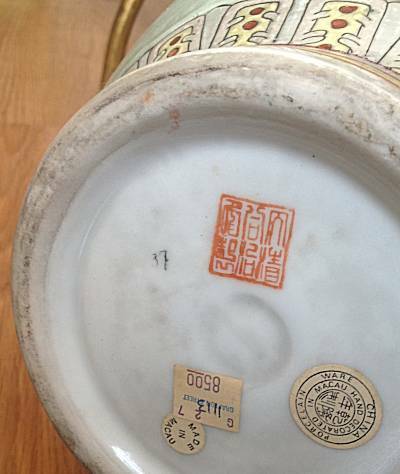 Mark: Da Qing Qianlong Nian Zhi meaning: "Great Qing Dynasty, Qianlong Period, Made". The three words below the mark reads Ao Men Zao meaning "made in Macau". The decoration is characterized by clear printed outlines, carelessly filled in with watery transparent enamel colors. Date: probably c. 1970. 495. Da Qing Qianlong Nian Zhi - "Great Qing Dynasty, Qianlong Period, Made". 'Macau style' decoration, probably 1960-70's. 838. Da Qing Qianlong Nian Zhi - "Great Qing Dynasty, Qianlong Period, Made". 'Macau style' decoration, probably 1960-70's. Secondary mark on base "K310". 959. Da Qing Qianlong Nian Zhi - "Great Qing Dynasty, Qianlong Period, Made". Ginger jar with sticker "CPC - Made in Macau". Known to be at least c. 30 years old, probably date 1960-70's. Secondary mark on base "067" within triangle. 959. Da Qing Qianlong Nian Zhi - "Great Qing Dynasty, Qianlong Period, Made". 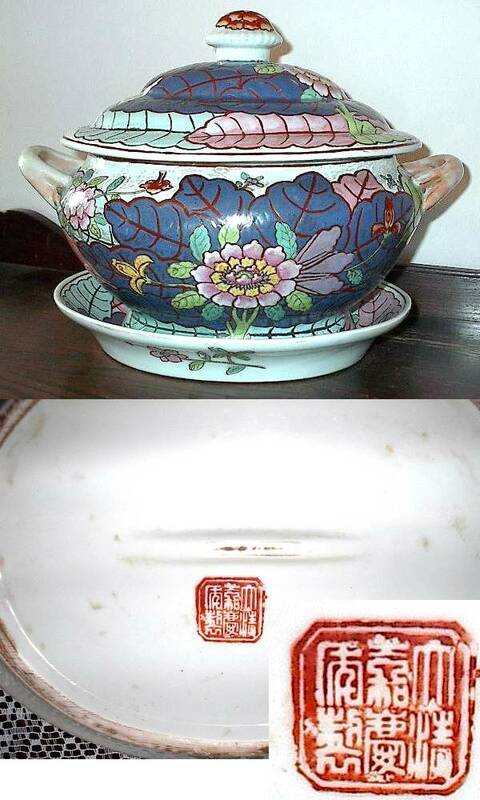 Bowl with sticker "Made in Macau" and "For decorative use only". Secondary mark 004 within a triangle. Probably date 1970s. Click here to see large picture. 809. Da Qing Qianlong Nian Zhi - "Great Qing Dynasty, Qianlong Period, Made". 'Macau style' decoration, probably 1960-70's. 890. Da Qing Qianlong Nian Zhi - "Great Qing Dynasty, Qianlong Period, Made". Sticker saying porcelain from China, decoration in Macau. Bowl diameter 10"/25cm. 'Macau style' decoration, probably 1960-70's. 801. Da Qing Qianlong Nian Zhi - "Great Qing Dynasty, Qianlong Period, Made". 'Macau style' decoration, probably 1960-70s. 808. Da Qing Qianlong Nian Zhi - "Great Qing Dynasty, Qianlong Period, Made". 'Macau style' decoration, probably 1960-70's. 802. Da Qing Qianlong Nian Zhi - "Great Qing Dynasty, Qianlong Period, Made". 'Macau style' decoration, probably 1970s-80s. 1060. Da Qing Qianlong Nian Zhi - "Great Qing Dynasty, Qianlong Period, Made". 'Macau style' mark, Possibly 1970s-80s period. 1541. Da Qing Qianlong Nian Zhi - "Great Qing Dynasty, Qianlong Period, Made". 'Macau style' mark, Possibly 1970s-80s period. 775. Qianlong Nian Zhi - "Qianlong Period, Made", 1970. Decorated in Macau according to a sticker on the base. If you look very closely at this mark and compares it to the similar marks used in Hong Kong at this time, the characters on this mark is written in a slightly western "italic" style as compared to the Hong Kong versions, which are drawn more formal and straight up. This mark is quite unique in that the identification of it as of Macau is possibly only thanks to the remaining paper labels added to the base. The unique character of the decoration should help in finding further pieces of this kind. 338. Qianlong Nian Zhi "Qianlong Period Made". The mark says "FARICDO EM MACAU" being a short for FABRICADO EM MACAU, mening "Made in Macau". Later part of 20th century. 1554. Qianlong Nian Zhi "Qianlong Period Made". The mark says "FARICDO EM MACAU" being a short for FABRICADO EM MACAU, mening "Made in Macau". Later part of 20th century. The style, manner and enamels used are same as what typifies Hongkong wares. 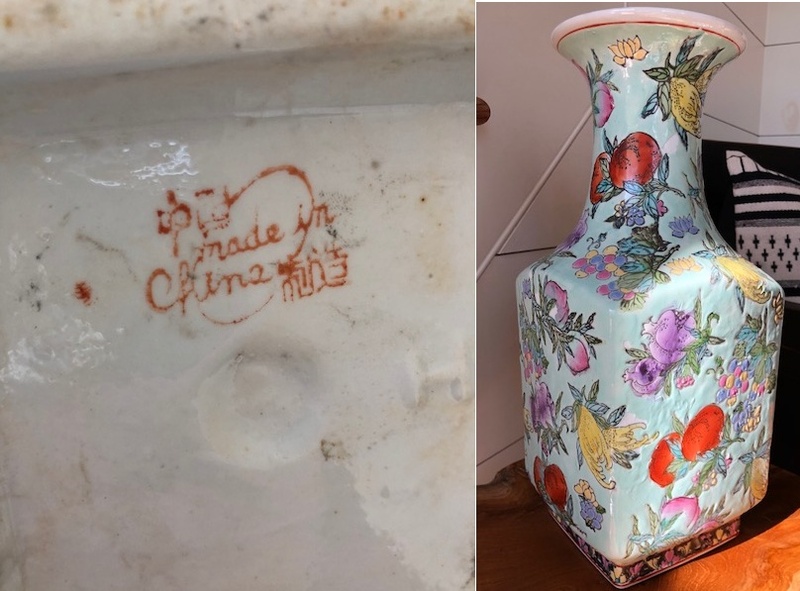 If I am to guess, if this vase is decorated in Macao at all, as the mark says, that might have been by a workshop that have moved out of Hongkong due to increased housing costs around the 1970s and one that have brought its signature enamels and outline stamps, etc. with them, because everything is typically "Hongkong", yet, the stamp says Macao. 507. Mark: Da Qing Jiaqing Nian Zhi - "Great Qing Jiaqing period (1796-1820) made". Possibly decorated in Macau c. 1960s. 698. Mark: Da Qing Jiaqing Nian Zhi - "Great Qing Jiaqing period (1796-1820) made". Possibly decorated in Macau c. 1960s. 594. Mark: Da Qing Jiaqing Nian Zhi - "Great Qing Jiaqing period (1796-1820) made". Possibly decorated in Macau c. 1960s. 643. Mark: Da Qing Jiaqing Nian Zhi - "Great Qing Jiaqing period (1796-1820) made". Possibly decorated in Macau c. 1960s. 644. Mark: Da Qing Jiaqing Nian Zhi - "Great Qing Jiaqing period (1796-1820) made". Possibly decorated in Macau c. 1960s. 760. Mark: Da Qing Jiaqing Nian Zhi - "Great Qing Jiaqing period (1796-1820) made". Inside the neck a sticker saying, Made in Hong Kong. Tentative date c. 1960-70s. Beside that the sticker indicates Hong Kong, this marks seems to be uniquely connected to Macau. 166. Da Qing Tungzhi Nian Zhi - "Great Qing Tungzhi (1862-74) Period Made". 'Macau style' enamels c. 1970 / probably mid to late 20th century. 765. Da Qing Tungzhi Nian Zhi - "Great Qing Tungzhi (1862-74) Period Made". 'Macau style' enamels c. 1970. 1461. Vase. Mark. Da Qing Tungzhi Nian Zhi - "Great Qing Tungzhi (1862-74) Period Made". 'Macau style' enamels c. 1970 to 1990. 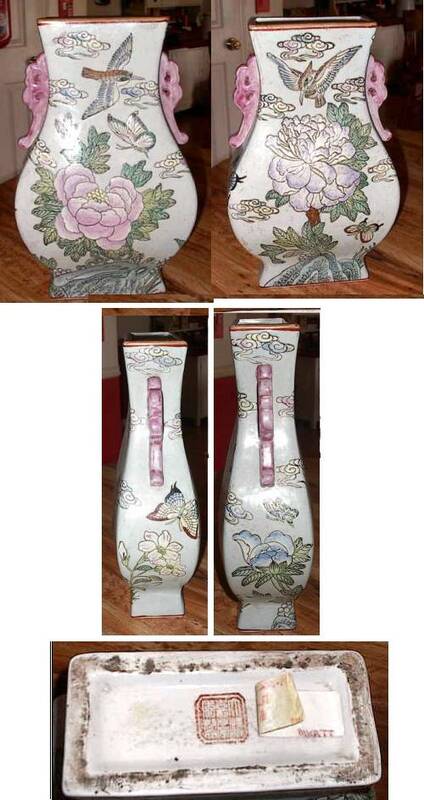 On the base of the vase are two stickers saying "China porcelain ware, hand decorated in Macau" and "Made in Macau" which I believe are contemporary with the vase and applied at the time of manufacture. 1462. Bowl. Mark: Da Qing Tungzhi Nian Zhi - "Great Qing Tungzhi (1862-74) Period Made". 'Macau style' enamels c. 1970 to 1990. 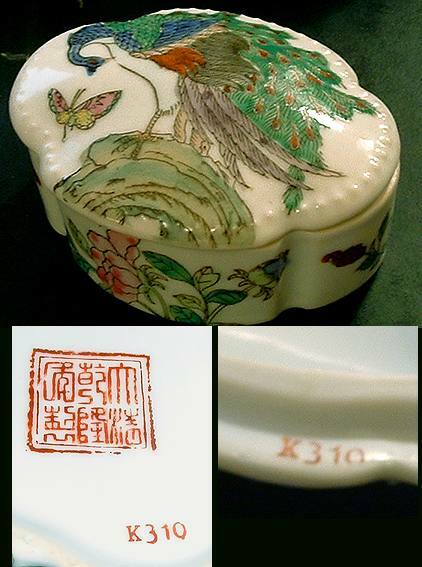 On the base of the basin are two paper labels, one round saying "Japan Porcelain Ware, Hand Decorated in Macau" and one rectangular saying "For Decorative Purposes Only, Not for Food Use, Made in Macau" which I believe are contemporary with the basin and applied at the time of manufacture. 786. Underglaze blue mark in Chinese Zhuanshu characters read from right to left: Heng Ming Jian Zhi flanked from right to left by Ao Men meaning; Macau. The four characters in the middle can be translated as "Heng Ming supervised Production" where the third character jian means "inspect", and the forth, zhi mean manufactured. Tentative date around 1980. This way of marking Chinese porcelain by adding a Fang character (Imitate) I have discussed at length with other porcelain specialists and we have come to the conclusion that this could not have been introduced earlier then after the Chinese "Cultural Revolution" which ended in 1975. During the Cultural Revolution it would probably have not been a good thing to want to 'imitate' something old. Earlier than that it is also unlikely that something would actually have been marked as 'imitating', so these marks all in all we feel should all date to 1975 or slightly later. After thinking further on this I have decided to move this whole section on Fang marks to the Macau section. First of all, all enamel marks to me now appears so obviously "Macau" style that I do think they do belong here. I also think that the idea of marking anything 'Fang' probably originated somewhere outside China in the first place; so Macau or possibly Hong Kong does fit the bill very well. 108. Mark: Da Qing Guangxu Nian Zhi The encircled character is 仿 - Fang = imitate, here used as a noun, since it is circled and independent. Compare with mark #89 below where "Fang" is used as a verb. 89. Fang Da Qing Qianlong - "Imitate Great Qing dynasty Qianlong period"
250. Fang Da Qing Qianlong - "Imitate Great Qing dynasty Qianlong period"
497. Fang Da Qing Qianlong - "Imitate Great Qing dynasty Qianlong period". Secondary mark '010' within a triangle. 504. Kangxi Nian Zhi Fang "Kangxi Period Made Imitate". Probably decorated in Macau around the 1970-80s. 728. Kangxi Nian Zhi Fang "Kangxi Period Made Copy". Probably decorated in Macau around the 1970-80s. 1041. Kangxi Nian Zhi Fang "Kangxi Period Made Copy". Probably decorated in Macau around the 1970-80s. 784. Kangxi Nian Zhi (Fang) - "Kangxi Period Make" under Fang = Imitate / copy character. Probably decorated in Macau around the 1970-80s. 133. Mark: Da Qing Fang Gu - "Great Qing Imitate / Copy". Fang and Gu are the same word, just two ways of writing it. 441. Fang Da Qing Qianlong Zhi - "Imitate Great Qing Qianlong Period Made". Probably decorated in Macau around the 1970-80s. 5. Mark: Zhongguo Zhi Zao - China Made. This manner of writing dates on the whole to the period of the Cultural Revolution, meaning from around the late 1960s and later. The enamels sees to correspond to what we recognize as those used in Macao. Date tentatively from mid 20th century and later. 1550. Mark: Zhongguo Zhi Zao - China Made. This manner of writing dates on the whole to the period of the Cultural Revolution, meaning from around the late 1960s and later. The enamels sees to correspond to what we recognize as those used in Macao. Date tentatively from mid 20th century and later. 1528. Lidded jar. TOYO Brand, Made in Macau. '009' within a triangle. Tentative date second half 20th century, probably around the 1980s. 1107. Four character stamped mark meaning 'Macau added enamel'. Additional paper label telling "Made in Macau For Ornamental not Food Service". Likely date 1970s, when concerns about the health aspect of some glazes was raised.